Simply put it is the ability to become aware of what happens here and now. Well you might ask; what is so special about it? Aren’t we aware of what happens here and now? Well to a certain degree we are. But when we speak of mindfulness we talk about the ability to know about what happens to us, around us, and importantly what happens within us in a clearer manner. Sometimes we realize what we have told or done long after, perhaps when the consequences are apparent or a little while later. Sometimes even while doing or saying. But in certain moments just before doing something, if we can become aware at that stage that it is the best, then we can choose our options. This is the beginning. As your practice improves your skill becomes better. It gives you the ability to Respond rather than React through habit. Improved mindfulness helps you discover a deeper stability in your whole being. You then begin to operate with a clearer perspective. You say you have been practicing mindfulness for the last thirty years. How did you start doing it and what were the benefits. In 1980 just by sheer coincidence I had the opportunity of spending few days at Rock Hill international meditation centre off Kandy where the Ven. Olande Ananda a Dutch Buddhist Monk was teaching meditation. Subsequently I met late Godwin Samararatne at Nilambe Meditation Centre where the emphasis was on applying mindfulness in different situations. There the concept was termed Karma Yoga. Later in 1989 I had the opportunity of spending a month in a Benadictian Hermitage called Takamor Soan in Japan, run by late Fr. Oshida who taught the importance of linking mindfulness to work. He said Zenna (meditation) in Activity is Thousand Times Better than Zenna in Sitting. These were the three significant exposures that encouraged me to take the practice of mindfulness away with me. Ever since then I have attempted to be as mindful as much as possible. It gradually transformed the way I live. But there were many moments in my life when I either said something or did something without being mindful, meaning that I realized what I said or did afterwards. Those are moments when I was not mindful. But whenever I was mindful I could choose my options. As a result of this practice I could distance myself from different situations and approach them with a sense of being in command. Being mindful has gradually made me a good observer. I think I learnt a hell of a lot from my own life because I could be aware of my intentions and motives objectively. Tell us how you found mindfulness to be useful in your career. I started my career from a very humble beginning as a clerk at a shop. 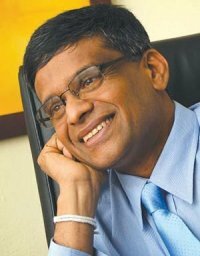 I left my corporate career as the Managing Director of the Sri Lankan operation of AVIVA Insurance. I would attribute my ability to succeed in my career significantly to my ability to live life, practicing mindfulness. This helped me to make the right decisions, to build meaningful and genuine relationships, and to become a good leader. Why do you say it is an executive capability? Just look around, the speed of change in the external environment is increasing by the minute. (Sounds better? )Organizations cannot just manage things. They need to build leadership as an organizational capability. The demands on today’s executives are multifaceted and they are sometimes conflicting. For instance they need to be fast at the same time and be extremely diligent and agile. They have to manage many relationships in a very delicate manner. The many roles one has to play demand extreme attention and contributions to all those roles. I feel this needs a new operating system which is more efficient. Mindfulness provides a very good operating system because it helps you realize what happens right now and right here. Once you are able to grasp the reality in the present moment you can Respond rather than React. This is a critical capability. Secondly the practice of mindfulness sharpens your ability to observe yourself hence the ability to observe the phenomena around you. It helps you to be comfortable with simple not so exciting matter such as breath. This skill enhances your ability to observe. You can find space in between all the business so that you respond with your whole being. You will feel the difference and your team too will feel the same. To master this skill what is the effort one has to make? It is called a skill because it is a capability that everyone has which can be improved by constant and structured practice. Take running as an example. Generally speaking any healthy person can run a few meters. But to become an athlete one has to practice a lot. Mindfulness or being aware of the present moment is no different. The more you practice the better you become. But every single moment of practice will build on what is already developed. I think it is a continuous process. The perfection is in the journey itself.